The Italian verb for spend is the irregular -ERE verb spendere. ... imagine let's SPEND 'ERE our Italian money! - spendere una fortuna : to spend a fortune. - il spendaccione (nm) : spendthrift, big spender. - la spesa (nf) : expenditure. - spendere e spandere (inf) : to splash money about. Other irregular ERE Verbs with changes in the Passato Remoto and the Past Participle conjugations include : ascendere, apprendere, comprendere, difendere, discendere, distendere, accendere, prendere, rendere, sospendere, spendere. Learn and remember Italian with Cartoon Memory Triggers! To remember a word, just think of the pic! Let's SPEND 'ERE our Italian money! non spendere (non) spenda! (non) spendiamo! (non) spendete! (non) spendano! 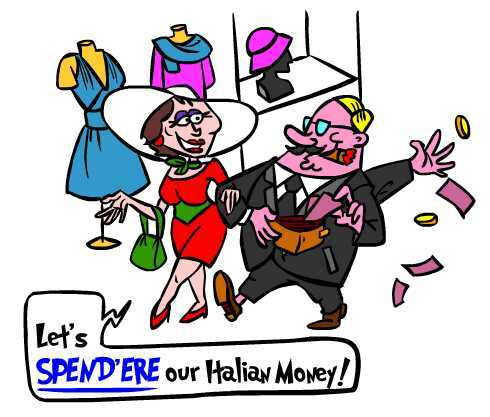 ✔ Spendere is an irregular -ERE verb. ✔ Learn spendere and it will reinforce the pattern for other -ERE verbs with the same irregular pattern. ✔ Do the daily verb every day to gain a solid knowledge of the -ERE and other verb families' conjugation patterns. ✔ You can more easily remember words and verbs like the Italian for spend - spendere using the techniques of the world's Memory Masters. 200 Words a Day! Free Daily Italian Lesson Online - the verb in Italian for spend is spendere - fully conjugated. Italian Learning Made Fun and Fast with your free Daily Italian Verb Lesson - spendere.